We had our Ironteam Kickoff event today at Sports Basement Potrero Hill! We met our teammates, our coaches, mentor, captains, and staff in general. We'll all be seeing a lot of in the next ten months! A lot of material was covered at kickoff and lasted a lot longer than the other TNT Kickoffs that I've attended. We arrived around 10am and didn't leave the community area until about 1:30pm or so! This year is the 10th year of Team In Training's Ironteam so there are big expectations! Expectations to raise the most money! Instead of calling our group Ironteam 2008..we're now Ironteam X representing two things- Ironteam 10th anniversary and Ironteam x factor! Our goal this season is to raise a whopping $1 million dollars in the fight against cancer! A large amount but definitely doable. They ended the kickoff with a video montage of the 2005 team. During that video, I saw many familiar faces..James..Emma Louise..Eric..I heard Rhian screaming and cheering in the background and thought to myself, "That must have been one fun team!" We were so fortunate to have them for our Spring 07 season! When I registered back in July..it was official that I was part of IT08. But after the kickoff, it's officially official! 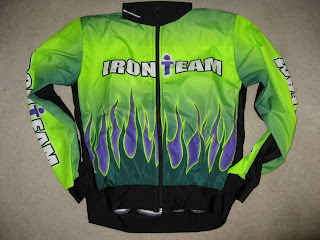 I will be sporting the obnoxious neon green and purple flames! I am really excited about the team and the season. I think it's finally hit me that I am doing something that I feel..is bigger than me in every way! Heidi, you hit the nail on the head!